Nothing says Pinoy party more than the classic Filipino pulutan. Make sure you have Lechon Kawali in your next family gathering. Perfect for chilling over beer. 1. In a Chef's Classics Camomile Sauce pot, combine pork belly, garlic, onion, salt, pepper corns, bay leaves and water. 2. Bring to a boil, skimming scum that floats on top. 3. Lower heat and continue cooking until fork-tender or approximately 45 minutes to an hour. 4. Drain pork from the liquid. 5. Place pork on a rack and refrigerate overnight to completely cool and dry. 6. Heat cooking oil in a Chef's Classics Camomile Sauce pot in enough oil for deep frying. Carefully place meat into the oil until golden brown and crispy. 7. 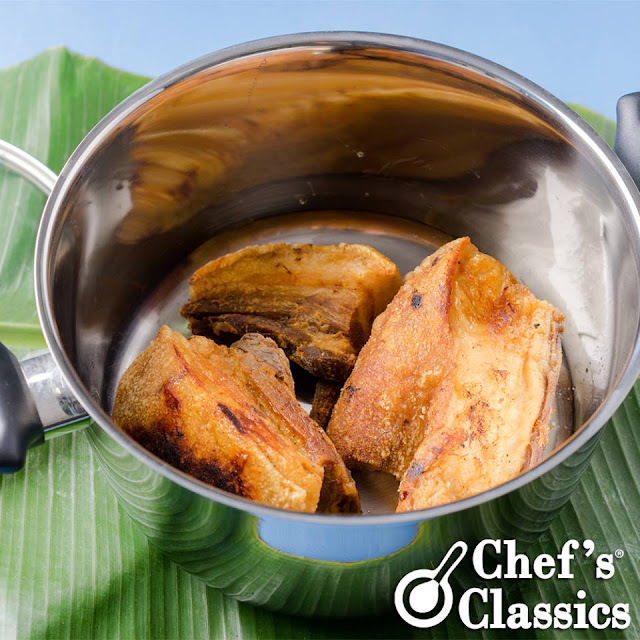 Remove the Lechon Kawali from the frypan. Let it cool and may serve it sliced. 8. Best serve with atchara or lechon sauce.